It’s been more than 20 months since the launch of the Frontier Technology Livestreaming (FTL) programme. Some of the first call pilots are now approaching completion. As a result, the Digital and Technology research group of the Institute of Development Studies have started to work on the first case studies. We have studied all documentation and publications generated by the pilots, interviewed their various stakeholders, and also reflected with members of the FTL team on everything that was learnt through the pilot’s sprints. Here we’ll talk about why we think this is so important, and some teasers on what to expect. IDS is leading the learning component of the programme. Why? 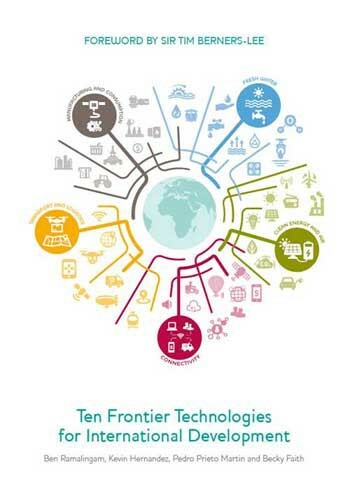 Our research group published the original “Ten Frontier Technologies for International Development” report, which was commissioned by DFID and came to inspire the FTL programme. We also contributed to the initial design of the programme, with its focus on experimental learning. Though we now help to select the most interesting pilots among the proposals received for each call, we are not much involved in the day-to-day management of the programme or the pilots — giving us an independent perspective. For all these reasons, we are well placed to support learning for the programme and to prepare a short case study for each of the pilots. Previous posts have already emphasised how learning is the cornerstone to everything the FTL programme does, and how the programme’s methodology — loosely inspired by Lean, Agile and PDIA approaches — ultimately aims to accelerate and maximise learning. In fact, learning concerns everybody involved in the programme, from the pilot implementers and technology providers — getting their hands dirty, adapting frontier technologies to make them solve development challenges — to the FTL team that select and support the pilots in various ways, to those overseeing the programme from DFID’s HQ in London. The learning for each of these stakeholders, however, occurs at different paces and depths. FTL pilots progress through a series of experimental learning sprints, which normally last several months. Critical assumptions are defined for each sprint — related, for example, to the technology’s desirability, viability, or the pilot’s route to scale and replication — which will be validated through a series of “build-measure-learn” phases. Continuous critical reflection helps the pilots’ assumptions to evolve. The FTL programme supports learning within the lifetime of the pilot not only through methodological coaching and the provision of technical assistance, but also through occasional field visits that aim to catalyse learning on the ground. Beyond the pilots, we strive to apply this iterative approach to the different aspects of the programme and structure our work in ways that enable us to pause and reflect at different paces. We perform regular reviews to learn from our mistakes and keep applying improvements to our processes and artefacts. As part of the learning component, we also plan to run programme wide “reflection and learning workshops” every other year, where the programme stakeholders will be able to meet, discuss and reflect. Now that pilots are slowly reaching their completion phase, we also intend to learn from them as a whole. This is one of the main motivations for the case studies: they give us an opportunity to reflect on the results, struggles and learnings emerging across the pilots. The case studies will not only to improve our understanding of how to apply particular frontier technologies to address development challenges, but will more generally help us to fine tune the programme’s tools, operating processes and our own theories of change and action. Since the pilots differ from each other in so many ways — the countries and contexts where they take place, the challenges they aim to address, the technologies they apply, the composition of the pilot teams, and the experience they have working with international development programmes… couldn’t be more varied— there may be differences in their evaluation of some aspects of the programme. For example, while a pilot told us that “this is without doubt the most elegant, easiest, light-weight process we have ever experienced”, another would confess us that for them “the administrative burden was so heavy that they doubt it would be worth applying for the programme again”. The truth is probably in-between. What is important is that in the meanwhile… we have applied many improvements to the way we work to make sure no pilot will feel such a burden. The pilots also made visible the tension that exists between the need, from the donor’s perspective, to apply rigorous due diligence and maintain accountability, and the need from the pilots to remain flexible and adaptive. This tension is never going to disappear, but at FTL we are getting better at navigating it. Finally, in our interactions with pilot teams we observed a great deal of passion and dedication to make the most of the opportunity created by FTL. Each of the visits the FTL team did to support pilots in countries like Zambia, Zimbabwe, Nepal or Tanzania… made a deep personal impression on them. As the programme progresses, we expect that our growing collection of case studies will contribute to further disseminate, within DFID and across the wider development sector, our learning on how to promote and use of frontier technologies for development. Soon we will publish the first of the case studies. As with everything at FTL, we plan to keep iterating and learning on how to research and communicate the cases. If you have any suggestion on how to do it better, we’d like to hear from you. And if you do not want to miss any of our future publications, make sure you follow our Medium page. Working with the UK Dept. for International Development to apply frontier technologies to the biggest challenges in development.